The words “craft cocktail” make most Vancouverites think of one particular area – Gastown. While there are obvious exceptions, and some great ones at that, the concentration of stellar bar programs here is staggering. Cocktail culture in Vancouver has been growing so dramatically over the last few years that most of the top establishments are no more than three years old. One of the most notable has to be L’Abattoir. Located in Gastown’s iconic Blood Alley, a drink’s throw from Gassy Jack, the award-winning French-influenced restaurant and impressive wine list is reason enough to visit. Add in their solid, simple, and classic cocktail program courtesy of Head Barman, Shaun Layton, and you have reason enough to visit regularly. Though the name (slaughterhouse) refers to one of several unconfirmed legends of Blood Alley’s past (the others include it being an execution site and Vancouver’s first prison) and the refurbished, century-old brick walls alongside tile and hanging antlers give the impression of both formality and Tobe Hooper, L’Abattoir is in fact quite casual and friendly. They were even named “Best Casual Restaurant” at this year’s Vancouver Magazine Awards. Casual accolades aside, the food and cocktails are as sophisticated as you could want, and Layton has found a comfortable niche for his bar that marries classic style with subtle, modern sensibilities. The “Classic Cocktails” menu is a collection that includes some sadly forgotten ones, and a look through the “Originals” reveals a strong, balanced selection that often extends on the classic ideals. 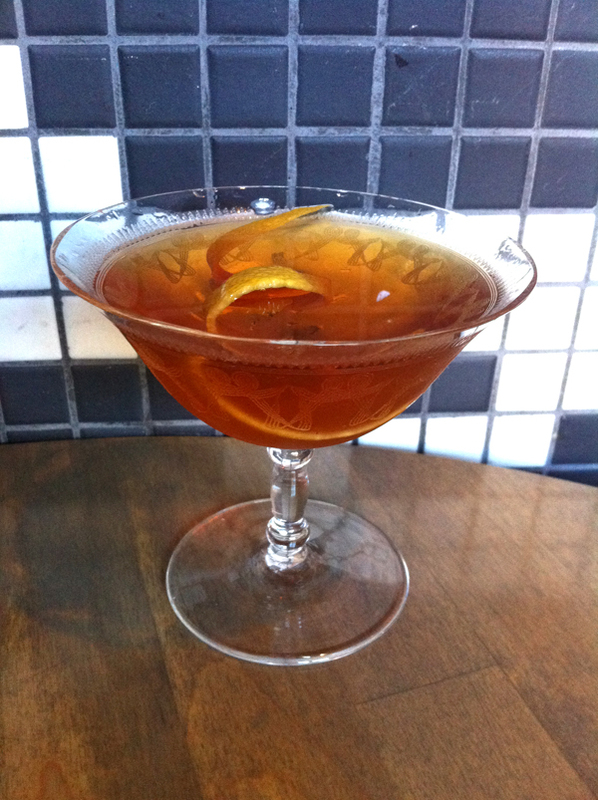 The “Slaughterhouse”, for example, is a Sazerac variation, decorating Cognac with Elixir Vegetal, aromatic bitters, and some orange oil and Green Chartreuse mist. The “Clover Club Refashioned” is simply the original refreshing Clover Club with added mint and sweet vermouth. There are lighter sippers for the less initiated, combining modern juices and liqueurs (try the “Gastown Swizzle” on a hot day), and even a beer cocktail using a chili-infused Tequila, but talking with Layton or his right-hand-man David Greig reveals they are much more interested in a well-balanced spirit-focussed cocktail. This is further evident by eyeing the tilted backbar shelves, covered in rare gins and whiskies plus a collection of unique products that are hard to get here in Canada. Layton has chosen his “Butchertown” cocktail to share, which is probably the most interesting on his menu. Named after an actual town in Kentucky, Layton designed the drink around two of the state’s major exports – bourbon and tobacco. Dry vermouth gives a different balance to each of the ingredients, allowing the bitterness of the Cynar and Becherovka to be more present, and just a touch of rum to hold things in place. It’s a quite dry and complex cocktail, and definitely a must-try for any enthusiast. Combine all ingredients with ice, stir, strain into a cocktail coupe. Garnish with a lemon twist.